You'll be £5.20 closer to your next £10.00 credit when you purchase German Secret Weapons of World War II. What's this? 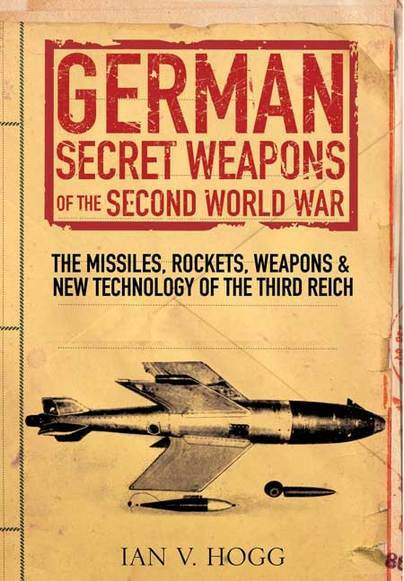 The phrase 'German Secret Weapons' immediately conjures up images of the V-1 and V-2 missiles which bombarded London in 1944. But what of the V-3 and V-4? What of Schmetterling, the Rochling shell, the Kurt bomb, the Hs293? These, and many other devices, were all part of the German secret armoury but are relatively unknown except to a handful of specialists. What of the German nuclear bomb? And the question of chemical warfare? The sheer magnitude of the secret weapon projects of the Third Reich is revealed in this comprehensive study written by one of the world's great experts on weaponry. The book explores the various fields in which the Germans concentrated their weapon development and discusses the multiplicity of ideas, the difficulties, and, in several cases, how these ideas were subsequently exploited by the victors. Although much of the German wartime development was not completed before the war's end, it nevertheless provided a foundation for a great deal of the munitions development which has since taken place. Comparisons with Allied projects are also drawn. This book explodes some of the myths surrounding Hitler's secret weapons to reveal a truth all the stranger for being fact. British and German scientists developed a wealth of new technology during WWII. The difference was that the British were a little more restrained and were able to fall back on US weapons that may have been less advanced and less capable, but could be produced in very large numbers, very quickly and be delivered to the front line. Their greater simplicity also tended to provide much greater reliability. However, the German rocket program and the exotic nature of some weapons has captured the imagination of generations since 1945. The author has produced a readable book that presents a range of German attempts to change the nature of warfare. It is a book that will appeal to a wide readership that includes those who are not normally interested in technology of weapons. There is a wealth of drawings throughout the book that brings to life this innovation. In addition, there is a photo-plate section that provides rare images to add to the story. A commendable work at a very reasonable price. A fascinating overview of the menagerie of ground-breaking weapons which Germany developed during the Second World War.